With our appointment starting at 9am on Monday we decided to just work from home that day. Since traffic can get crazy in our area we left the house around 7:30 and stopped for a leisurely breakfast. I was starting to feel nervous and couldn't eat much. Work has been incredibly busy and frustrating so I really hadn't had the time or energy to be anxious about this appointment. I pushed the negative thoughts aside and ate as much I could, taking the Metformin on an empty stomach has never ended well. We got to the office a little before nine and only waited a few minutes for Nurse V. Once settled in her office she started to go over the FET schedule. I would finish out the active pills in my current BCP pack with the last pill being take on 4/6. The protocol includes a Lupron overlap which will start at 10iu on 4/2. After stopping the pill we wait for CD1 to schedule baseline. FET monitoring takes place on a Tuesday and Friday schedule. Once CD1 arrives my baseline will be whichever of those days comes first. If everything looks good and quiet in ovary land we will begin. Lupron will drop down to 5iu once the estrogen injections begin. I will continue the Lupron daily until progesterone injections start. The estrogen will be Delestrogen, an intramuscular (IM) shot. It will be taken every Tuesday and Friday night, the dosage being determined by that morning's monitoring appointment, until Dr. S is happy with my lining. Once perfect lining has been achieved the progesterone stage will begin. I will start taking IM PIO (progesterone in oil) shots every morning. Six days later we will have our embryo transfer. The day of transfer we add in a vaginal progesterone as well that will be taken nightly. There is no need for anesthesia for transfer so I will take a sleeping pill the night before and a Valium 90 minutes prior to transfer. After our little butterfly is in my ute they’ll keep me for about 30 minutes before sending me home for 24 hours of bed rest. The PIO and vaginal progesterone will continue daily until beta (blood pregnancy test). If our butterfly has snuggled in and pregnancy is achieved the medications will continue through the first trimester. With our preliminary calendar in place it was time to learn about IM shots. IM shots are, as their name suggests, injected straight into the muscle. The injection area is the upper outer quadrant of the buttocks. When Nurse V pulled out the syringe I felt my heart race. The needle is 1.5” long and extremely intimidating. Dave will be administering the injections and we shared a nervous glance. Nurse V assured us that it really isn’t that bad and gave instructions for icing beforehand and using a heating pad afterwards. After going over the shots she took my blood pressure. The number was high and she chuckled, remembering that she should have taken it before bringing out the enormous needles. The last topic we covered was choosing our embryo. Dave and I had already discussed it and were ready to meet with Dr. F. Nurse V called her down and she went over our results. Since the CCS results showed all four were normal she felt any of them would be a good choice. In her opinion #2 and #3 were best. #2 is a 5bb Day 6 blastocyst while #3 is a 5bb Day 5 blastocyst. We decided to go with butterfly #2. Overall Dr. F felt we had a great chance and was very happy with our embryos. On the way home Mandell’s called to confirm my order. I arranged to pick it up this weekend. It all feels so real now. Come late April/early May we should be transferring our little butterfly into my uterus. I’m trying to stay guarded, but the excitement is starting to build. Our IF journey could soon be transitioning to a pregnancy journey. On Friday night we had dinner with Dave's parents and told them the good news. They were very excited for us. His mom was even more excited when we talked about our future plans of moving. We'd like to move up north, most likely settling down in the same town as Dave's best friend J. This would put us about 20 minutes away from Dave's parents. His mom even mentioned happily retiring to take care of our kids, most likely when we're ready for baby #2. We'll cross that bridge when we get to it. After dinner we went to meet up with previously mentioned best friend J. At the bar I got a strange feeling and decided to run to the bathroom while the boys caught up. Lo and behold there was a tinge of pink on the toilet paper. Of all the days to be cute and wear a thong... Luckily I had a small pad in my purse and made it work. Later in the evening when J went to the restroom I let Dave know the situation. His eyes lit up and he excitedly hugged me. He was elated to be one step closer to becoming a father. CD1 officially came the next morning and I called the office to let them know. We met my brother and his girlfriend for lunch and I ended up missing the call from Nurse V. She told me to refill my birth control and she would follow up with further instructions. After not hearing back on Sunday I called and left a message for her this morning. She called back soon after. I will be starting the birth control pills tonight. We go in for our FET injections class next Monday morning. Dave may be a little too excited to learn how to do the IM shots. This feels like a dream. 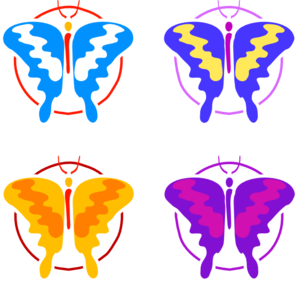 All four of our butterflies have the perfect number of chromosomes. There are two boys and two girls. I can't believe it and haven't stopped smiling. We are over the moon. Hopefully my period makes an appearance early next week and we can start moving forward with the FET. The CCS results should be back tomorrow or Thursday and hopefully have a few perfectly healthy butterflies. Once my period shows up, hopefully early next week, we can begin prepping for the FET. I will place this here in recognition of my husband being correct. All along he was confident that our embryos would make it while I stressed and worried about them. Yes honey, you were right and are free to say "I told you so". My biggest fear over the past few days has been my phone ringing. Specifically, the embryologist calling to say our four butterflies didn't make it. Every time my phone lights up with a text or FB message, I cringe. Our butterflies are 4 days old today. Tomorrow or Sunday they should turn into beautiful little blastocysts, get biopsied, and then frozen. This weekend Dave and I don't have any plans. I'll need lots of distractions so we'll try and get some kitchen projects done . Or we'll just play Final Fantasy XIV all weekend. Either would work. One thing I may have to do is go out clothes shopping. I have been living in leggings, tights, and yoga pants since late last week. The bloat has been unbelievable and I can't imagine jeans happening for a while. My wardrobe is extremely limited right now so I could use more stretchy pants and long flowy tops. They'll also come in handy for pregnancy, right? It scares me to actually try and think that far ahead. If we get good news on Monday I'll allow myself a little more hope. Mommy and daddy love you little butterflies! Keep growing strong! Wow, it’s been a while. Sorry about that, but things moved very quickly from Saturday on. I had monitoring early Saturday morning and the nurse called in the early afternoon. Lo and behold it was go time. I would take both trigger shots that night at 9:30pm and go in for the egg retrieval at 9am Monday morning. Having to take both triggers was a good sign that I wasn’t at risk for OHSS. On Sunday it was another early morning to get ready for a NJ Dreamer’s baby shower. I met up with a fellow NJ Dreamer and we drove down to South Jersey together. The shower was a blast and had lots of very fun games. We even ended up winning the ‘build a baby item with play-doh’ game! It was great to see the girls and I got lots of well wishes for the following day. Monday morning came very quickly. Luckily the threat of snow had delayed a lot of schools and the roads were relatively clear. There was barely a dusting on the ground when we left the house. After signing some paperwork I was taken into the back to change. I was happy to see my RE would be doing the procedure. The anesthesiologist came in and inserted the IV. I’ve never had a hand IV before and it hurt like hell going in. They had me walk into the procedure room and get set up on the table. As the nurses prepped everything the anesthesiologist started to give me the happy drugs. The first one was an anti-nausea med. The second was a relaxant. I felt it go through my whole body and started to feel sleepy. The last one he did was the drug to knock me out. The last thing I remember was the nurses wrapping my legs and one of them smiled at me. The next thing I knew I was waking up in recovery. They brought Dave in and we sat for a bit while the fog cleared. Dr. S came in to give his report. They had retrieved ten eggs from my right ovary. My left ovary had ended up fixed behind my uterus and he didn’t want to risk going through the uterus to get to it. I would ovulate any mature eggs on that ovary naturally. Because of this I would not have to take the vaginal progesterone meds. The embryologist would call me the next day with our fertilization report. I was instructed to take it easy for the next few days and call on CD1 to get the ball rolling for the FET. Once I felt better we headed home and I laid in bed the rest of the day. I stayed home from work on Tuesday as I was still very sore and unable to move around much comfortably. The embryologist called around 8:30 with our fertilization report. Out of the ten eggs retrieved only four were mature. All four had fertilized without assistance. We would get our final report on Monday. This would tell us how many made it to blastocysts, were biopsied, and then frozen. The CCS testing results would come a few days later. So now we are stuck in limbo until Monday. I’m feeling very nervous about only having four little butterflies. Yes, they could all be amazing and make it to freeze, but I was hoping to have more. I am so mad at my left ovary. Maybe it was a stupid dream to think that we could get away with having one IVF and only have to do FETs to get all of our children. I guess we’ll just have to wait and see.